Customer service in the power tool industry is an interesting thing. I picture lawyers standing over beaten, hunchbacked representatives who are giving the company line and afraid to commit to any operation or function other than what’s listed in the manual. 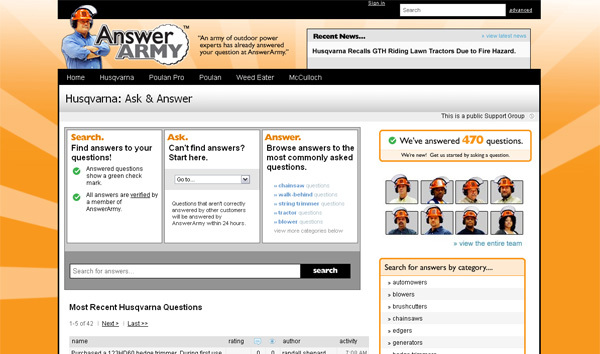 But recently Husqvarna has taken a unique stance on customer service and started the Answer Army site. It’s a good idea they’ve managed to come up with here, if they’re truly responsive to the real problems folks have with their products. We’re hoping Answer Army, after a few months of user interaction, will become a comprehensive tool for keeping you from ‘sploding the saw or removing parts of your anatomy. In our humblest of opinions, saving the headache of maintenance issues and a few limbs would be worth any time and effort Husqvarna put into it. In this day and age, I would think every major manufacturer would have a forum to communicate with its customer base. Unless they are afraid of being overwhelmed by bad press from shoddy production. Talk about finding a need and supplying the answers. I might give this site a shot, it’s surprising how poor customer service is now a days. ereplacementparts is an excellent resource for tool parts, tutorials and advice through their website and forum.